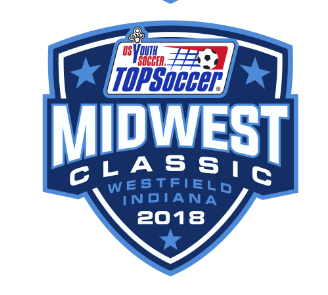 US Youth Soccer’s Midwest Region is excited to announce the first TOPSoccer event to be included within a major US Youth Soccer championship tournament! This is a unique event that we will be planning to offer on an annual basis to coincide with the Midwest Regional Championships, where the elite teams in the Midwest battle it out for a chance to play in the National Championships. Our goal is to expose these players and their families to the joys of TOPSoccer while providing an amazing experience for our own players. We are inviting TOPSoccer players of all age and ability levels to join us on Monday June 25th at Grand Park in Westfield, IN for an afternoon of fun and games. We will have various levels of play and competition to satisfy every player’s ability level, including a competitive showcase tournament for our higher ability players. Individuals, as well as entire teams are welcome to register for this free event. Every player will receive a t-shirt, medal, and will be celebrated in front of their peers and US Youth Soccer leaders. Volunteer buddies will be provided for all players. You can find more information as well as the link to register by visiting the main event page here.